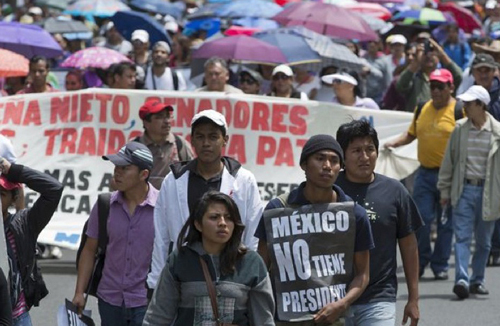 Mexico teachers striking in September 2013.Today the fight is against the education reform law, but also over the broader political agenda of Pena Nieto, and neither side seems prepared to back down. Since school began again on August 19, 2013 tens of thousands of teachers have been engaged in strikes and demonstrations throughout Mexico�including seizing public buildings, highway toll booths and border crossing stations, occupying public buildings and city plazas, and blocking foreign embassies�actions taken against the Education Reform Law and the new Professional Teaching Law and over local demands linked to wages and working conditions. While these are traditional tactics, these are the largest and most militant teachers� union demonstrations in Mexican history. The National Coordinating Committee (la CNTE), an opposition caucus within the Mexican Teacher Union (el SNTE), leading about 200,000 of the nation�s 1.2 million teachers, appears to have won a moral victory, even if it has not yet succeeded in its goal of overturning the new laws. As commentators have suggested, the dissident teachers of la CNTE have largely been successful in discrediting and delegitimising the unilaterally imposed education reforms, as well as in moderating their impact through small concessions granted by the government. Yet at the same time, it is not clear where the teachers� strikes are going. It is not clear how long these strikes and protests can continue without exhausting the teachers and their parent and student supporters if there is not some intermediate goal short of overturning the new education laws. The teachers� protests, however, are not solely motivated by their concerns about their jobs and salaries. La CNTE also opposes to the government�s plan to open the Mexican Petroleum Company (PEMEX) to private investment and to pass new tax laws expected to benefit the rich and harm working people and the poor. As one longtime labour activist told me, the teachers� strikes have been accompanied by an unparalleled radicalisation of the population throughout the country. The left-led CNTE thus finds itself at the head of an inchoate national movement opposed to Pe�a Nieto�s political agenda. Leading the teachers� movement has been Local 22, the Oaxaca Teachers Union, the historic leader of the teachers� movement, which has mobilised tens of thousands of its striking members, 30,000 of whom occupied the zoc�lo or Plaza of the Constitution in Mexico City filled with their tents, lean-tos, and huts. Driven by opposition to the education "reforms", based on teacher evaluations linked to student performance on tests, the traditional annual protests of tens of thousands of teachers from Oaxaca, Chiapas, and the Federal District (Mexico City)�that have taken place for the last 40 years at the beginning of every school year�grew this year to include large numbers of teachers from the states of Michoac�n and Veracruz as well as from about 20 other of the country�s 31 entities. Throughout the country teachers received support from some students and parents, from university employees, and from a few independent labour unions. For a few hours on September 13, it seemed as if the Oaxaca teachers� occupation of the z�calo, the national Plaza of the Constitution in the centre of Mexico City, might lead to violent repression of the movement. But violence was averted when teachers voluntarily abandoned the z�calo for the Mexican Independence Day celebrations. Still, the teachers� demonstrations continue in Mexico City, choosing new targets�public spaces, private corporations, foreign governments�every day. Yet, while the teachers have won a moral victory, the entrenched political system they have been fighting for four decades, as well as the recent reforms that threaten their employment security, continue in place. President Enrique Pe�a Nieto�s Education Reform and the Professional Teaching Law remain in place, the president�s Institutional Revolutionary Party (PRI) continues to have a plurality in both houses of Congress (a majority with its small satellite parties); the president, of course, controls the federal secretary of public education; and the Mexican Teachers Union (el SNTE) remains loyal to the PRI-government. While the protest demonstrations by approximately one-sixth of the teachers have been spectacular, they have not succeeded in having the national political impact that the teachers desire. As the teachers have been engaged in these impressive nationwide strikes and protest demonstrations, no other section of the labour movement has gone into motion either over its own issues or in sympathy and solidarity with the teachers. Controlled by the churros, the labour bureaucracy loyal to the PRI and to the government, both public sector and private sector workers have quietly gone about their work. Surprisingly, not even a single section of the public sector workers has rallied to the teachers� union�s call for opposition to Pe�a Nieto and the PRI. The teachers remain engaged in an impressive and at times spectacular struggle, but it is one taking place in relative isolation form the rest of the labour movement, which remains inert. While the dissidents remain a minority within the teachers' union�even if an impressively large minority�and while the rest of the labour movement remains quiescent, there appears to be little chance of the teachers� forcing the government to backtrack on its education policy. Historically, whenever the Mexican government has felt threatened by a mass movement which might become a challenge to its political power, it has mobilised the police and the army to crush the movement. The 1959 railroad workers' strike, perceived to by the government to be a Communist-led assault on the government, was suppressed by the Mexican Army, with thousands fired, the leaders jailed for years, and some killed and many injured in the repression of the movement. When students protested to demand democracy in 1968, taking advantage of the fact that Olympic Games were being held in Mexico, the government attacked their demonstration, killing hundreds. A similar suppression of the student movement took place in 1971. The Mexican Electrical Workers (STERM) and their Democratic Tendency (TD) attempted to carry out a general strike in 1976 that was also suppressed by the army with firings, arrests and the break-up of the movement. More recently, on October 10, 2011, the Mexican government of President Felipe Calder�n sent police and army to seize the Light and Power Company facilities, dissolving the company and firing 44,000 workers, eliminating the independent and oppositional union from the workplace. Calder�n�s government also brought false charges against Napole�n G�mez Urrutia, head of the Miners and Metal Workers Union, forcing him to seek asylum in Canada. The Mexican teachers of la CNTE are well aware of this history. For years the Mexican Teachers Union was headed by Carlos Jongitud Barrios, leader of the Revolutionary Vanguard caucus associated with the PRI. Under his leadership of the union, dissident teachers in areas like Oaxaca and Chiapas faced not only firings and beatings, but sometimes assassination. The activists in those states, then as now, were principally Indigenous, bilingual teachers, mostly women organisers at the base with elected leaders and spokespeople were usually men. The teachers fought for 40 years to win the right to control their unions and to decide their own fate. Today the fight is against the education reform law, but also over the broader political agenda of Pe�a Nieto, and neither side seems prepared to back down. Yet Pe�a Nieto would pay a very high political price, giving up his claim to represent a new and more democratic direction for Mexico. And any such massive national repression would have to have the approval of President Barack Obama and his administration.